Blooming gardens and exclusive facilities, just by the Cretan Sea. On of the most luxury hideaways of Greece, Royal Mare in Limenas Hersonissou, is situated at a comfortable 20-minute drive form the local International Airport and the vibrant capital Iraklion. Surrounded by vast stretches of water and exotic gardens, the 345 spacious guestrooms and 40 deluxe suites open to spelndid garden of sea vistas. 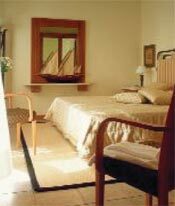 Each guestroom is appointed with all modern amenities, including air-conditioning, marble bathroom and Satellite TV. There are eight restaurants serving a wide variety of menus ranging from international specialities to gourmet, diet, traditional Greek and children's menus. an array of cocktails, refreshments are served at the hotel's elegant bars. 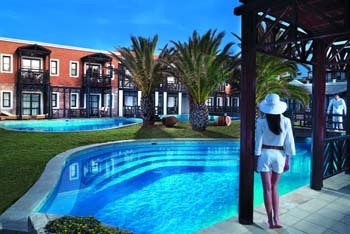 The wealth of facilities includes a model Thalassotherapy Spa Centre, fitness centre and a shopping arcade. There are 2 outdoor fresh-water pools, 23 sharing and private outdoor pools for the VIP sharing pool rooms and suites, 7 tennis courts (clay), beach volley and archery facilities, as well as squash, tennis, sailing, water-skiing, aerobics and underwater exploration. Night entertainment includes a wide variety of evening programmes by expert animators and a night club. There is a meeting room with a capacity of 80 pax. A fully equipped Conference Centre is available at sister-complex Aldemar Knossos Royal with a capacity of 900 pax.